New Category, New Week Theme! This is my blog. I pay to maintain it, and while it’s not a huge sum of money, it’s probably ridiculous given what I get out of it. So I’m going to experiment a little with what goes on here, because I can, because see previous sentence. THIS WEEK, I intend to post five of my favorite pictures from my father’s recent trip to India. My dad and I have similar senses of humor, and as I browsed through his eleventy gazillion photos, I giggled several times. Please note that these are NOT giggle-worthy because I’m mocking people whose first language isn’t English. It’s always tough to explain exactly what I mean when I say that some signs are just fun. Even when their authors are native English speakers, some signs just end up creating a sense of delightful whimsy — or panic — or expressing huge levels of frustration. Whatever it is, the sign communicates more than just information, and I like to stop and look at it. And it’s true that when one learns a foreign language, one can sometimes create perfectly legitimate, communicative sentences that are nonetheless delightful, whether because they’re unintentionally funny or because of idiomatic usages or, yes, because they’re just so oddly wrong that they’re funny. So before I start out my week of Delightful Signs From Dad’s Trip, I’m going to get the ball rolling with one of my own. I may have mentioned or even posted this before. I wrote it, but in my own defense it was before I had studied Mandarin, and therefore before I knew anything at all about stroke order or… anything, really. I found myself living in a long-term hotel in Beijing with basically no Chinese language skills at all. My colleagues in the hotel told me they were getting soap daily as part of their room-cleanings, but I hadn’t been. So I decided to set out to ask, as nicely as I could, for soap, from the nice cleaning people who always managed to come when we weren’t around. I’m not even sure this sign is comprehensible. But here you go, it’s below, because I’ll put my money where my mouth is. Okay: and also because I don’t feel like telling several of the other stories of linguistic mistakes I’ve made! Speak Mandarin? 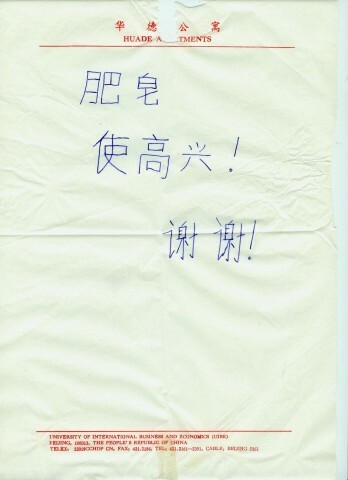 Feel like telling me what this actually says (if it’s even legible?) Bring it on! mom and dad both say that the sign does make some sense, but dad adds that, “it is obviously written by an american.” dad also added that the characters are pretty good except for the first line, where they should be the same size. so kudos to you!